FUNDING STRATEGIES IN A TIME OF CRISIS AND GETTING YOUR BOARD ON BOARD! Non-profits live and operate in extremely difficult times! There are 3 types of non-profits operating currently namely the ones that have perished and became victims of the funding crisis, those who are struggling to maintain themselves and thirdly those who anticipated the crisis and managed to avoid it. However, the fundraising scene is not improving for all non-profits in South Africa. It is actually getting worse! Just recently, in November 2011, a major national non-profit decided to close down all its rural offices. Let’s face it. Budgets on social expenditure have been diverted to the World Cup and now we are paying the price. Donors (and government) are moving more and more toward very big non-profits who can demonstrate big impact so that they can justify their appeals for raising funds from their sources. The effect is that more and more medium to smaller non-profits are pushed to the periphery and being marginalized. More and more international donors are exiting South Africa claiming we are now a middle income country and must look after itself. What they conveniently forget is that in terms of the black population SA is a third world country with the highest ratio of income inequality in the world. Already it was announced that Atlantic Philanthropies from the US and maybe even the Ford Foundation will wind up operations in 2012. Cordaid from the Netherlands has already started exiting. This will be a major blow for many non-profits who received their funding from these sources. Already there is speculation that PEPFAR funding (for HIV/Aids) will be phased out in 2012. In order to survive this reality, non-profits will be forced to reposition themselves as a matter of urgency!! If a climate of urgency does not permeate the corridors of each and every non-profit then there is a big problem!! It is extremely desperate and difficult times!!! All this is on top of a deepening funding, and at a deeper level, a leadership crisis, with its roots post 1994. Even non-profits who were well funded and highly professional are now feeling the pinch, with retrenchments in the sector becoming the norm rather than the exception. It is within this frightening unfolding scenario that I decided to launch a series of rural outreach seminars in various areas in the Western Cape. The objective was simple. Reach as many leaders and managers in the sector in the shortest space of time to address two vital and interrelated topics: Funding strategies for non-profits in a time of financial crisis and getting your board on board. Through partnerships with local municipalities and other host organizations almost 200 people were reached in three regions namely the Boland, Central Karoo and Klein Karoo. The Cape Winelands District Municipality (in the Boland region), Karoo Centre for Human Rights (in the Central Karoo region) and the Oudtshoorn Municipality (in the Klein Karoo) offered support in terms of access to transport, training space and catering. Facilitation was voluntary but participants were encouraged to make small donations to cover the logistical costs of the facilitator. 1. The massive interest in the seminars indicates a big need for the information shared with participants. 2. 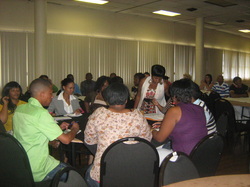 The partnership approach was vital to the success of the seminars. 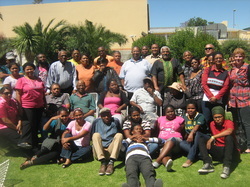 The support provided by the municipalities was especially critical. 3. Many people in the rural areas are denied access to training opportunities due to lack of finance as well as geographical location. The seminars overcame these constraints by allowing people to offer a donation (some people did not pay anything) and taking the seminars to the people. 4. Follow up support is as important as the training itself. 5. People understand the need for networking but lack the understanding of what networking is all about as well as formal structure to concretize their networking activity. 6. Most of the participating non-profits do not have the basic strategies in place to address the current crisis namely a funding strategy, marketing strategy, board development plan, staff development plan, risk management strategy, etc. 7. Focusing on the current crisis has led to non-profits neglecting important learning processes and a lack of understanding of the big picture. 8. There is a serious need for ongoing leadership and management training for non-profits. 9. There is an over-dependency on accessing financial support via funding proposals with a lack of focus on mobilizing local resources. 10. Levels of anxiety are extremely high in many non-profits with many staff members being despondent about their own personal future prospects and that of their organizations. Follow up workshops have been agreed upon with the various partners and host organizations for March and April 2012 and I look forward to check whether participants were able to implement some of the ideas shared with them.